BMW has released first official pictures of the new R1200 CL Luxury Cruiser model, which will be unveiled at the Munich show in September. It will join BMW’s line-up from this autumn. Based on the " James Bond " R1200C, launched in 1997, this version is built for the American market but is available to order from GB dealers. It comes in: metallic silver, metallic blue and metallic brown. The upper edge of the screen is not in the line of vision. This is a particular advantage when riding in rain or if the windscreen becomes dirty on long journeys. (An even shorter screen is available as an optional extra.) In addition, the rider can control the degree of wind deflection and protection by opening additional air deflectors if the weather worsens. 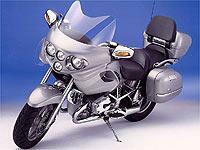 The windscreen’s upper edge has a cutaway contoured like a wave to deflect airflow around the rider. Separate bodywork panels on either side of the machine are integrated aerodynamically with windscreen and tank, not only deflecting the airflow but increasing downforce to enhance stability. Four headlights are integrated into the fairing - two for low beams and two for high beams - which gives the R1200 CL an unmistakable face and ensures excellent illumination. Typical cruisers have raked-out, front forks. To retain this essential cruiser element, BMW's unique Telelever front suspension system has been completely reworked. A consequence is that the fork struts are now further apart in order to accommodate the more stable 150mm-wide front tyres. Also new are the fork sliders (EVO brake adapted), slider bridge, fork bridge and full floating axle. The rear wheel guide features a new spring strut with a progressive damping system (as featured on the R1150 GS Adventure) to ensure road comfort. Pre-load adjustment can easily be made by hand. The rear wheel, swingarm and axle housing have been reinforced and modified to accept the larger rear brake. In addition, a brand new, reinforced rear frame has been designed to take the footboards, case supports, luggage rack, modified side supports and new seats. Generous footboards for the rider contribute to a relaxed riding position. Seats are separate for passenger and rider. The rider's wide, saddle comes with integrated hip support and - thanks to the adjustablity of the footboards and a ride height of 74.5cm (29.3in). Thepassenger's seat has also been designed to provide a comparable level of comfort but is slightly higher to afford a better view over the rider's shoulder. Integrated colour-matched luggage cases and top case are fitted as standard and include a luggage bridge made of cast aluminium that incorporates pillion grab handles. The cases are watertight and feature a surround closing system. The newly designed cast aluminium wheels are small - a 16-inch front and 15-inch rear - but allow the use of extra large tyres: 150/80 and 170/80 respectively. The R1200 CL is the first BMW cruiser available with EVO front wheel braking as standard and optional Integral ABS. The R1200 CL is equipped with the same engine that has already been proven in the R1200 C. The 1170cc, boxer engine is tuned to produce more torque for use at slow speed rather than for maximum power. Finished in high quality chrome, the big twin delivers 61 bhp at 5000 rpm, but equally important is that it produces 70 lbft of torque at just 3,000 rpm. The engine's torque is fed to the rear wheel through a new six-speed gearbox, heel-toe gear change and BMW's proven drive shaft. Sixth gear has been configured as an overdrive and together with the 17.5-litre fuel tank should provide a touring range of between 150 and 200 miles. It comes with a closed-loop, three-way catalytic converter. BMW dealers will also offer a wide range of accessories, including passenger backrest and footboards, cylinder protection hoops, inner bags for the panniers, cup holders and an on-board communication system.